This name uses Spanish naming customs: the first or paternal family name is Rujano and the second or maternal family name is Guillen. Rujano at the 2012 Giro d'Italia. José Humberto Rujano Guillen (born 18 February 1982) is a Venezuelan road bicycle racer who competed professionally between 2003 and 2013, and currently rides for the Multi Repuestos Bosa amateur team. Born in Santa Cruz de Mora, Mérida, Rujano made his debut in the professional peloton in 2003 with the Colombia–Selle Italia team. 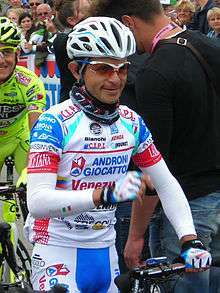 In 2005 Rujano had his best year to date, finishing third in the Giro d'Italia and winning the mountains classification. In 2006 he left the Colombia-Selle Italia team for Quick Step and he moved to the Spanish ProTour team Caisse d'Epargne in 2008. His results were not up to the expectations of team leaders, who did not renew his contract at the end of the season. In 2010, Rujano joined the Italian Professional Continental team ISD-Neri. He was not selected for the Giro d'Italia, his main objective for the season, so he left the team in May and returned to Venezuela. At the end of 2010, Rujano signed a contract for two years with the Italian team Androni Giocattoli, directed by Gianni Savio who said that he "believed in his talent" and wanted "to revive his career." Rujano was recruited at the same time as the Italian climber Emanuele Sella, Savio referring to giving these two riders a "last chance". His main objective for 2011 was the Giro d'Italia, and especially its mountain stages. 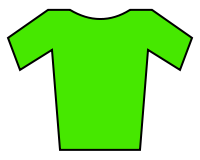 He lived up to his objectives since he prevailed on 2 mountain stages in the race: stage 9 from Messina to Etna after original winner Alberto Contador was removed from the rankings due to a doping affair and stage 13 from Spilimbergo to Grossglockner, while finishing sixth in the overall classification. In the 2012 Giro d'Italia, Rujano pulled out of the race, reportedly suffering from mononucleosis. Rujano left Androni Giocattoli–Venezuela at the end of 2012, and joined Vacansoleil–DCM for the 2013 season. Rujano reportedly retired during the 2013 season, but later in the season, he backtracked from his retirement and remained within the professional fold after terminating his contract with Vacansoleil–DCM. 1 2 Rujano was promoted one position retroactively, after Alberto Contador's results were disqualified following his backdated two-year ban in February 2012. ↑ "Who 'wins' after Contador ban". Velo News. VeloNews.com. 6 February 2012. Retrieved 21 April 2012. ↑ "José Rujano wins Grossglockner stage as Alberto Contador extends his lead". Velo News. VeloNews.com. 20 May 2011. Retrieved 21 April 2012. ↑ Shane Stokes (1 June 2012). "Rujano claims mononucleosis is reason for Giro withdrawal". VeloNation. VeloNation LLC. Retrieved 1 January 2013. ↑ "Vacansoleil unveils 2013 jersey". Cycling News. Future Publishing Limited. 17 December 2012. Retrieved 17 December 2012. ↑ "Rujano retires from pro cycling". Cyclingnews.com. Future plc. 24 June 2013. Retrieved 9 September 2013. ↑ "José Rujano and Vacansoleil-DCM separate ways in good consultation". Vacansoleil–DCM. Vacansoleil Eindhoven. 23 September 2013. Retrieved 30 September 2013. ↑ "New winners emerge from Contador's suspension". Cyclingnews.com. Immediate Media Company. 7 February 2012. Retrieved 21 November 2016. Wikimedia Commons has media related to José Rujano.